Jesska Denise: Dry Shampoo - My Two Cents. Dry Shampoo - My Two Cents. This post is a bit different than usual.. Its not a review as such. More my 'two cents' on dry shampoo and wanting to see what you guys think, so please make sure you leave a comment below. This is a weird one for me. I mean so many of you seem incredibly dedicated to your can's of dry shampoo but ahh ~unpopular opinion alert~ I just don't get it? It just really irks me. Obviously some of us have hair that gets greasier than others and may feel the need to whip this out for whatever reason. However, any time i use it I can't help feeling that it makes my hair look dreadful. No matter how hard I try it always makes my hair feel quite gritty and powdery feeling even though it's not visible on my hair and trust me, I have tried a few different brands of dry shampoo. The exception for me would be the 'superdrug' own brand one but thats purely down to the lack of overwhelming scent and powdery feel. Its actually perfect for using when your hair is just washed and you want to get rid of the 'clean clean' that makes it impossible to do anything with your hair as its so slippery. But other than that, I don't get the hype. Maybe its cause I'm blessed with hair that doesn't need to be washed every single day and don't actually need to reach for this?? I put this down to minimal use of hair products and keeping my hair brush cleaned. I'm always surprised by people who don't regularly clean their hairbrushes/replace them. I mean you wouldn't continue to run a dirty foundation brush all over your face, why do the same with your hair brush? Thats a whole other situation though. Yeh I don't get it, to me it's like getting a handful of baby powder and plopping it all over your hair you know?! I actually won this one above in a giveaway a few months back and generally only use it on a night out and want to 'oomph up my hair, not what it was intended for. It's a weird one and I'm just weird. Comment your thoughts below guys. I love dry shampoo, its such a life saver! I agree! When i tries dry shampoo it just made me smell funny and look like I had dandruff! 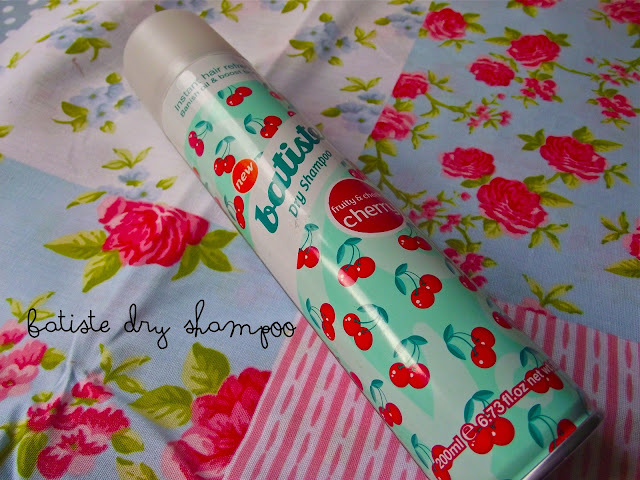 I only ever use Batiste when I really really need it. It does make your texture a little gritty like you said. I get oily hair fairly quickly and it actually helps a little but I would have to spray literally loads! I love the scent of the blush version. I would never replace actual hair washing with dry shampoo, but I do find it a godsend for my fringe. My hair doesn't need washing every day either, but the fringe inevitably gets a bit oily from resting on the forehead in hot weather and this is a nice boost/pick me up - if my fringe looks clean then my whole head of hair can stay looking freshly washed for longer.